In this example, we will contribute a basic search dialog to illustrate the steps needed to create a custom subclass of FilteredItemsSelectionDialog. Create a new Plug-in Project using Hello, world template. Create a class extending org.eclipse.ui.dialogs.FilteredItemsSelectionDialog. 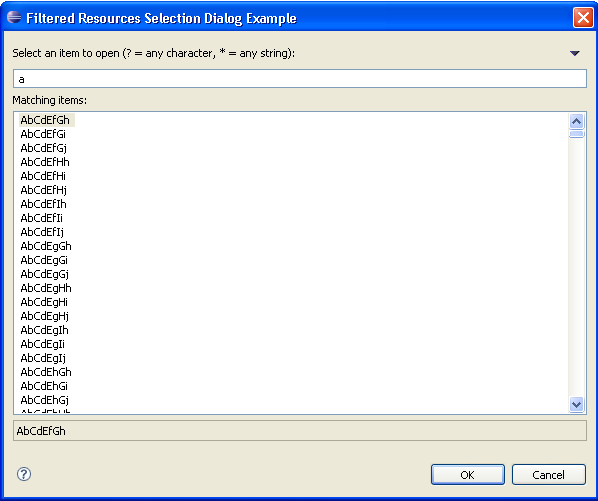 Let's name it FilteredResourcesSelectionDialogExample. Now, let's implement abstract methods from the FilteredItemsSelectionDialog class. getElementName(Object): Returns a name for the given object. This is used to check duplicates. Change tooltip of SimpleAction from "Hello, Eclipse world" to "Filtered Items Selection Dialog Example". Run Eclipse with created plug-in.